A happily surprised winner. Photograph by Kelly Neal. NEW YORK—A short-story writer dedicated to giving authentic voice to characters as they try to connect with the people closest to them is the 2012 winner of the nation’s largest student literary award. 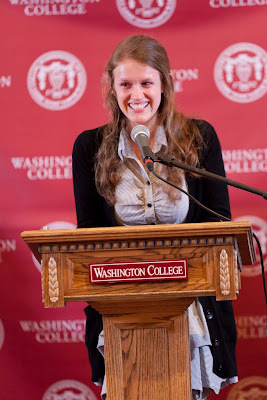 Washington College will award the Sophie Kerr Prize to Kathryn J. Manion at commencement May 20 in the form of a check for $58,274. Manion and four other Prize finalists read their poetry and fiction aloud Tuesday night, May 15, at a private event in midtown Manhattan and then watched internationally celebrated novelist Colum McCann open an envelope and announce her name as the 2012 winner. But Manion, an English major from Clarksville, Md., took the prize with her submission of four short stories she considers works in progress, and excerpts of her thesis on the role of letter writing in literature—a study that drew from the novels of Jane Austen, Mary Shelley, George Eliot and Emily Bronte. The central characters of Manion’s fiction are mostly young adults in unsatisfying or damaging relationships. In one short story, an insecure college freshman yearns for a more meaningful relationship with his mother as he navigates issues of sexuality and social life. In another, a former spelling bee champion is interrogated about the murder of his abusive father. Manion, who minors in Creative Writing and Anthropology, has been a leader in the community of student writers at Washington College. She has been at the helm of the Writers’ Union, a student run group that gathers at the Rose O'Neill Literary House for workshops, readings and social events and publishes an online literary journal. She also participated in the Writers’ Theater and edited copy for the campus literary magazine, The Collegian. The Sophie Kerr Prize is the namesake of an Eastern Shore woman who forged a successful career in the New York publishing world. Born in Denton, Md., in 1880, she graduated from Hood College and worked as the women’s page editor at two Pittsburgh newspapers before moving to New York and becoming managing editor of the Woman’s Home Companion. A prolific writer, Kerr wrote 23 novels and published hundreds of short stories in the popular magazines of the day, including The Saturday Evening Post, Collier’s, and McCall’s. 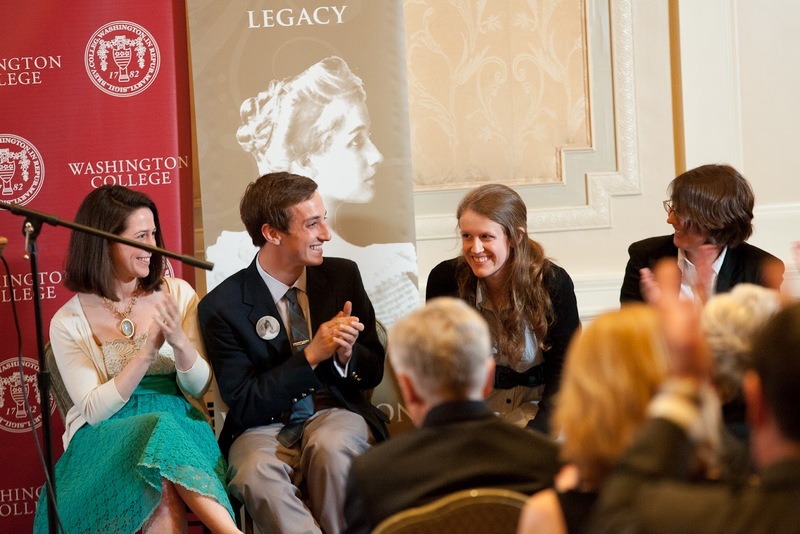 When she died in 1965, she left more than $500,000 to Washington College with the stipulation that half the income from the bequest would be awarded annually to the senior showing “the most ability and promise for future fulfillment in the field of literary endeavor.” Over the years, the endowment from Kerr’s gift has provided more than $1.4 million in prize money to promising young writers, in amounts that have ranged from $9,000 the inaugural year, 1968, to a high of nearly $69,000 in 2009. The winners have gone on to establish careers as writers, editors, teachers, and marketing professionals, and many have published their work as novels or collections of short stories or poetry. The other half of Kerr’s bequest funds scholarships and library acquisitions and brings a parade of world-class literary figures to campus for public readings and workshops. Such literary luminaries as Edward Albee, Jonathan Franzen and Toni Morrison have visited Washington College under the auspices of the Sophie Kerr Lecture Series. Recent guests have included novelists Junot Diaz and Nick Flynn and poet Natasha Trethewey. is announced. Photograph by Kelly Neal. Washington College is a private, independent college of liberal arts and sciences located in historic Chestertown on Maryland’s Eastern Shore. Founded in 1782 under the patronage of George Washington, it was the first college to be chartered in the new nation. For more information, visit http://www.washcoll.edu.